The built-in localization mechanism in Silverlight and WPF allows you to localize any string resource used by the standard RadUpload control. Once translated you might use your resources in both Silverlight and WPF projects without changing anything. 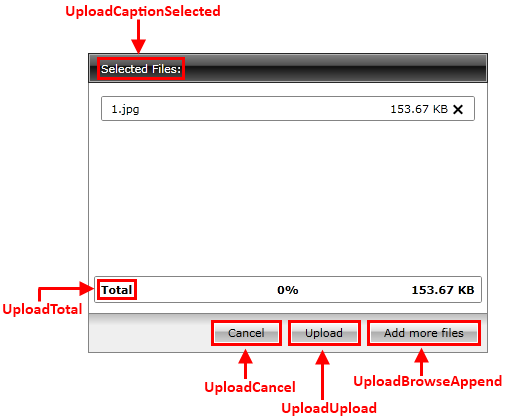 RadUpload is a complex user interface control and its strings for localization are numerous. In order to be able to distinguish these resources, a unique identifier called resource key is assigned to each localizable string. UploadBufferSizeSoBig BufferSize too big. Please set it to a smaller value. 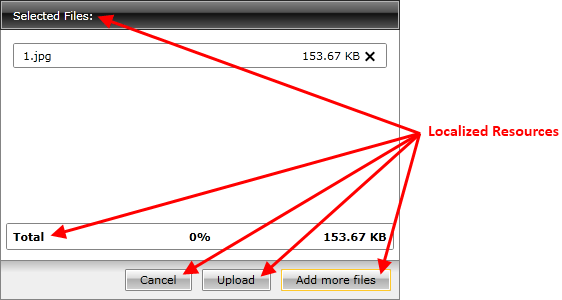 UploadUploadServiceUrlInvalidPropertyValue Invalid upload url. Please make sure the url is absolute! UploadHandlerNotFoundOrFailed Handler not found or execution of the handler failed!